It has been almost a year since a Jayam Ravi movie has hit the screens. Ameer's Aadhi Bhagavan was released in the month of February last year and the actor's next movie has not showed up ever since. 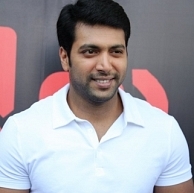 However, 2014 looks like a more happening year for Jayam Ravi as he has three movies lined up and expected to be released in quick successions. Nimirnthu Nil, directed by Samuthirakani is slated for a February 14 release while Bhooloham, directed by Kalyanakrishnan is eyeing for a suitable release date soon. The actor also gave some interesting information about his next movie directed by Raja which will have Nayanthara play the female protagonist. The team is looking to rope in Arjun Rampal or Irrfan Khan as the main antagonist in the film as the script demands a strong negative role. Will Nimirnthu Nil Match Vishwaroopam? THE LUNCH BOX - DELECTABLE FARE!!! People looking for online information on Arjun Rampal, Irrfan Khan, Jayam Ravi, Nimirnthu Nil will find this news story useful.